The City’s Planning and Zoning Commission, along with the Building Department and Building Committee works with residents, businesses and community leaders to shape development of the City. 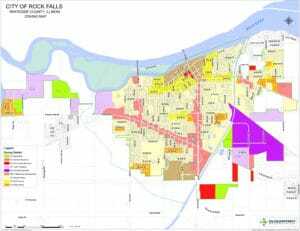 The City of Rock Falls is divided up into different zones, that determine what types of development can happen in each of those zones. The map for these zones is available via the link for review. Note: This zoning map is updated periodically and it listed on the map of the latest date of revision. The Industrial Development Commission has adopted certain working rules for the Industrial Parks to make them a uniform business district. These rules relate to any new construction within the parks, and are normally enforced by the Industrial Development Commission and the Building Inspector. Please download this list of requirements for building within the Rock Falls Industrial Park located off of Route 30 in Rock Falls. Any questions regarding these Covenants should be directed to the Building Department. The building department also receives any correspondence for the Planning Commission. Below are forms that are required for the issues that would come before the planning Commission. Rezoning Form — This form is used when someone wishes to change the current zone of their property. Please download the form, fill it out and submit it back to the Building department, at 603 W. 10th Street, Rock Falls, IL 61071. Variance/Interpretation of Zoning Map/Special Exception — This form is used when someone wants to apply for a variance from the Standard Zoning code requirements, when someone wants to have the Planning Commission examine the zoning map and interpret the map when there is a question and when someone wants to get Special Usage status for a project, such as when they want to create a cemetery in a residential zone, a child care facility in a residential zone or many other items, which are spelled out in sections 16-101, 16-121, 16-141, 16-145, 16-161, 16-181, 16-241and 16-270 of the Current Rock Falls Zoning Code. paid. Business must be “open for business” before reimbursement is granted. Please download this application for more information.